Private Mission to Mars in 2018: Who Should Go? 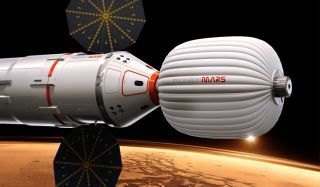 An artist's illustration of the Inspiration Mars Foundation's spacecraft for a 2021 mission to Mars by a two-person crew. The private Mars mission would be a flyby trip around the Red Planet. WASHINGTON — A new, privately funded campaign is on to launch a manned mission to fly by Mars in 2018. Of the numerous open questions about the voyage, one of the most pressing is, who should go? Space tourist Dennis Tito announced the plans Wednesday (Feb. 27) during a press conference in Washington, D.C., at which he described a new nonprofit organization he founded, the Inspiration Mars Foundation, to plan the mission. Tito envisions sending two crewmembers on a roughly 500-day trip to Mars and back. To combat the isolation and loneliness that could set in, the Inspiration Mars team hopes to recruit a married male-female couple to make the private Mars mission in 2018 together. Poynter and her husband, Taber MacCallum, who is chief technology officer for Inspiration Mars, spent two years living inside the Biosphere 2 experiment, and learned the benefits of having a close companion to lean on. "It was extremely helpful to have somebody that I could problem solve with," Poynter said. "It was also fantastic to have the opportunity to be there and share the experience when we had those wondrous moments." Inspiration Mars plans to recruit highly qualified crewmembers with the technical background necessary to serve as space mechanics on all aspects of their vehicle, should it need repairs. For their part, Poynter and MacCallum aren't just mission planners — they also plan to throw their hats in the ring as crew applicants. The trip, which would capitalize on a rare planetary alignment that allows for a boomerang mission around the Red Planet much more quickly than normal trajectories, would largely use existing hardware, spacecraft and rockets, but with some modifications to support a crew for such an extended period. Thus, whoever signs up for the trip will be in for some Spartan conditions. "This going to be a very austere mission," MacCallum said, comparing the Mars voyagers to Lewis and Clark, blazing a trail through the unknown. "It scares me a little bit," Poynter told SPACE.com. "I'd be lying if I said it didn't. But the opportunity to look back at the Earth from Mars — that's an experience not to miss." Space tourist Dennis Tito proposes a Mars flyby mission with a trajectory shown here. Whoever undertakes the mission will need "the right stuff times 50," Tito said. The successful applicants must be resilient, even-keel, and able to maintain a happy attitude in the face of adversity, Poynter said. Despite the challenges, though, Inspiration Mars is expecting a flood of applications from people eager for the chance to make history by traveling farther into space than ever before. The team's medical expert, Jonathan Clark of the Center for Space Medicine at Baylor College of Medicine, said the crewmembers must also be prepared to face some health challenges. In addition to the havoc that a year and a half of microgravity will weak on the human body, the Mars travelers will face a strong dose of radiation, which could elevate their risk for cancer by about three percent. "The crew would know about it, they would have to decide, 'I realize that I'm going to have an excess cancer risk," Clark said. "Ultimately it's going to have to be those personal decisions."